Simple golf league management with access for your players! 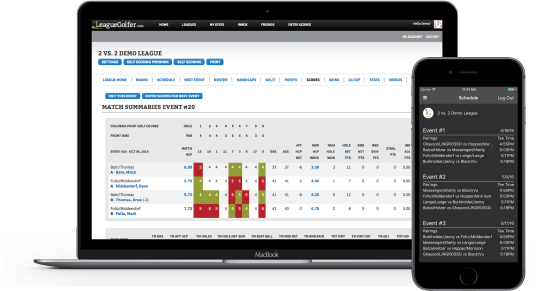 Our easy to use, online Golf League Software Website automates tedious tasks like scheduling, scoring and handicaps, saves you time, and includes a free trial. Easy League Set-up - just 5 simple steps done in 10-15 minutes and you're ready to go. Robust Scheduling Module - schedules are just a click away with automatic scheduling. Setup Schedule with Position Weeks and Randomizer. Quick Scoring - speed data input with quick type score card, instantly confirmed in a visual scoring table. Play by your Rules - customization options for almost all point systems. Automatic Treasury Accounting - makes collecting fees for regular players and subs a breeze. Check Ranks, Statistics & Historical Trends - review stats and history against all types of statistics and other golfers for this season and previous ones. Chart every Round - seamless integration between league and non-league rounds provide a single view of careers without re-entering data. Play after Handicap Skins - generate an automatic skins report for any event, normalizing each golfer's hole score after his handicap with complete stats. View Handicap Scoring and Season Stats - automatic handicapping summaries and posting gives everyone something to talk about. Network with Friends - create a network of friends. Search for networks. Messaging - built in email module. Send and receive messages. Inbox, notifications, etc. Friends - look for friends and receive friend requests. Keep track of their game and stats. Profiles - create your own profile and see other golfer's profiles. Upload your own photo, privacy and view settings, etc. One year, one league, unlimited golfers. Click here to try it free for 21 days.